Nearly two-dozen California artists have been busily using their paint brushes to turn inanimate, life-size cows into works of art for charity. The charity is Camp Ronald McDonald for Good Times. 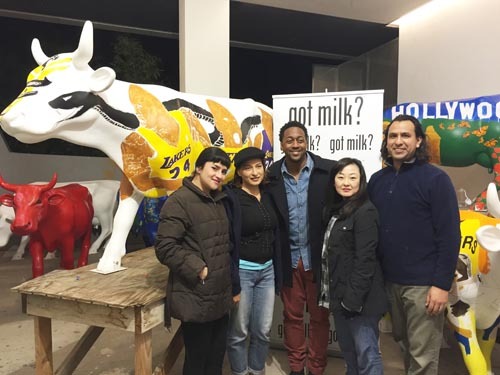 The project is the work of the California Milk Processor Board (CMPB), creator of the iconic “got milk?” campaign, which is now promoting local artists along with its traditional message of wellbeing with its new campaign, Milk Loves Art. To ensure the quality of the final pieces going to auction, renowned muralist, George Yepes, is leading the creative phase of the campaign and working closely with the artists involved. Yepes will also be painting one of the 31 sculptures. Several of the artists involved spent several days last week painting at a temporary studio at East Los Angeles College. Other artists have been painting in their own studios. Camp Ronald McDonald will auction off the works of art with proceeds going to support the program, which offers a cost-free, medically-supervised, camp experience for more than 1,500 children with cancer and their families each year, helping them find hope, enthusiasm and joy in the therapeutic environment of the great outdoors. For more information about Milk Loves Art, visit: www.gotmilk.com.